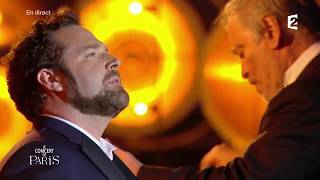 Summer 2016 sees Bryan Hymel performing Verdi and Puccini, finishing the 2015-16 season in La traviata at Opéra National de Paris. Making his debut at the Chorégies d’Orange festival, Bryan performs Puccini’s Madama Butterfly. The American tenor sings the role of Pinkerton under the baton of Finnish conductor Mikko Franck with Ermonela Jaho as Cio-Cio San, Marc Barrard as Sharpless and Marie-Nicole Lemieux as Suzuki. Bryan can be seen performing in the historic Roman theater on July 9 and 12. Continuing the summer festival season, Bryan makes another debut on August 5 at the Festival Castell Peralada in a recital with soprano Irini Kyriakidou and pianist Julius Drake.